The imagePROGRAF iPF840 brings in new capabilities to high-volume inkjet printing for the imagePROGRAF line. The reformulated magenta ink, Gigabit Ethernet compatibility, and Two Media Roll System, produce the fine lines, speed, and functionality you’d expect from an imagePROGRAF large-format printer. With a 320 GB hard drive and Sub-Ink Tank system, these printers can fit virtually into any high-volume, inkjet workflow. 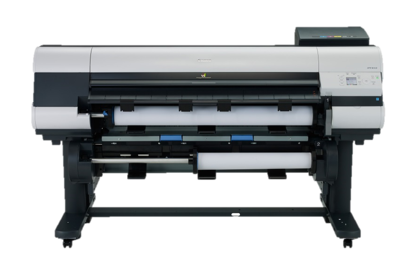 A 44-inch wide powerhouse printing system designed to enhance productivity for medium to large workgroups, with dual roles and high speed throughout. With incredible line accuracy, a 320GB harddrive, excellent media handling and on-board support for HP-GL/2 and HP RTL files, the iPF840 is a complete and easy-to-use printing solution for any professional with a need for producing intricately detailed full-color renderings, CAD drawings, GIAS maps and other large-format output.